The cost of producing one megawatt-hour of electricity from coal is now double the cost of solar. 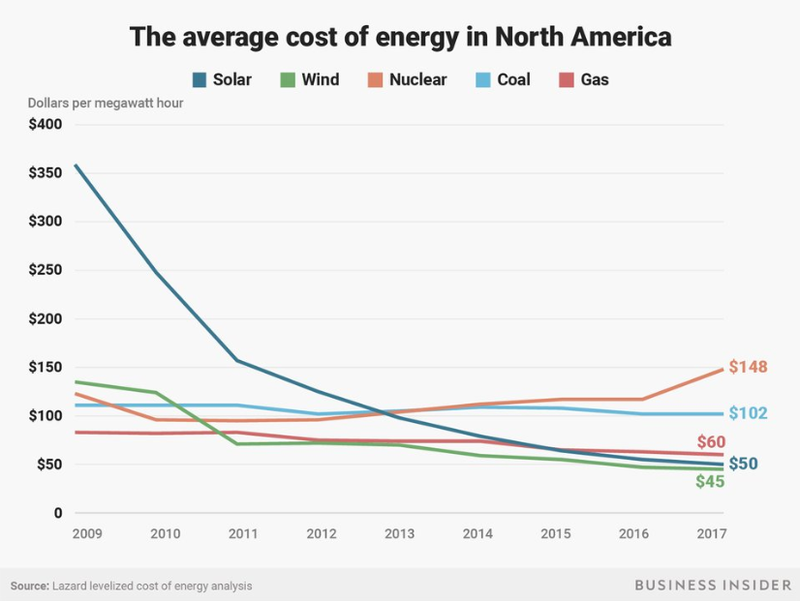 The cost of solar power is decreasing so rapidly, it's now cheaper than coal, based on a new analysis. The cost of producing one megawatt-hour of electricity — a standard way to measure electricity production — is now around $50 for solar power, according to Lazard's math. The cost of producing one megawatt-hour of electricity from coal, by comparison, is $102 — more than double the cost of solar. Lazard's analysis is based on a measurement known as the levelized cost of energy analysis (LCOE), which is a way of calculating the total production cost of building and operating an electricity-generating plant. 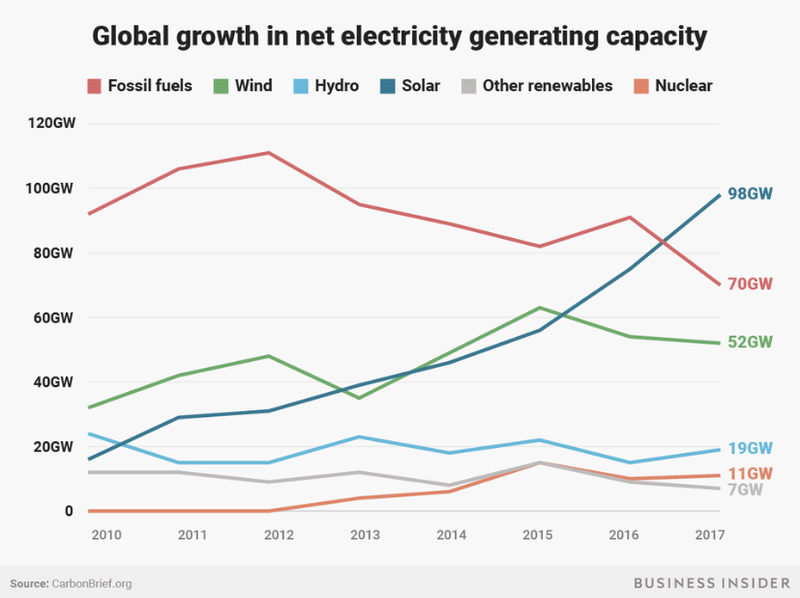 The rise of renewables is apparent when you look at which types of new energy generation capacity are getting added around the world. In 2017, there was more new solar power capacity created than any other type of energy, according to a report from the United Nations Environment Programme. Renewable energy, including wind, hydro, and solar, supplied a record 12% of the world's energy needs last year. In 2017 alone, the solar sector attracted $160.8 billion in investment, an 18% increase over 2016, according to the UNEP report. In the US, solar still only provides 2% of the country's total electricity needs, according to the Solar Energy Industries Association. But California is trying to change that: The state is seeking to mandate that most new homes be outfitted with solar panels. State lawmakers are scheduled to vote on the proposal on Wednesday.